Well, I didn’t publish a book in 2018. I wrote one, but it’s pending an agent’s interest. I took a break from working on two other novels to write this post. One is a women’s fiction, and the other a contemporary romance that might be the first in a series. So my goal for 2019 is to publish at least one of them! It was a busy year. I attended several author/reader events locally as well as the Romance Writers of America conference in Denver and the Penned Con book fair in St. Louis. Met up with writer friends, made new connections and had a blast meeting readers. That said, we are now truly empty nesters. And that feels weird. And it changes everything! No more winter breaks that last three to four weeks. No more “Spring Break.” Our daughter was home for Christmas, but only for a few days. We were only able to fit in a quick overnight to see my folks because both kids had to be back at work the day after Christmas. Our daughter flew back to New York on Christmas Day. This new reality is cramping my style, for sure! But it’s like the old saying, “The only thing constant is change.” It just keeps coming! I don’t know what 2019 will bring, but I’m hoping for new adventures, new connections and new books! Wishing you all peace, good health and happiness! So we’re planning to get a Christmas tree this weekend. We always get a live tree, and almost always end up going on one of the coldest nights of the year. That’s not the plan, as I am a winter weather wimp, but as fate would have it . . . that’s the way it goes. I’m watching the forecast, but whatever, the schedule says it’s this weekend. Because we don’t want to wait too late. One year, a few years ago, we decided to wait until both kids were home from college before getting the tree. You know, make it a fun family outing. Well, we did have that, but when we pulled up to our longtime Christmas tree lot, the place was packed up and put away. Gone. Except for . . . this. One lone deformed tree had been left behind. I mean, this tree made Charlie Brown’s tree look like perfection. At least his was shaped like a tree! This thing looked more like a shrub in need of a serious trimming — something fitting for a Dr. Seuss scene. Sitting in the car in the cold, we considered our options. Go drive around and try to find another lot that was open? I have no idea whether there were any others that still had trees. It didn’t matter, though, because a kind of poor-baby sympathy began to well up for this pathetic little tree-thing that nobody wanted. Plus, it was free, right? In the spirit of Christmas, we decided to give the thing a home. So, we loaded it up and took it with us. My husband had to hack and saw on it just to get it into the tree stand. Once inside the living room, there was a definite “now what?” moment. Laugh or cry?! Well, we dressed it up as best we could with our usual ornaments. Had we known this is what we’d end up with for the year, we might have come up with a clever “theme” more fitting of the situation. But time was running out, so we made do. In the end, we kind of liked our wacky little Seuss bush-tree. It was worth some laughs. And made a fond family memory! Do you have a favorite let’s-make-the-best-of-it holiday story? Do share! 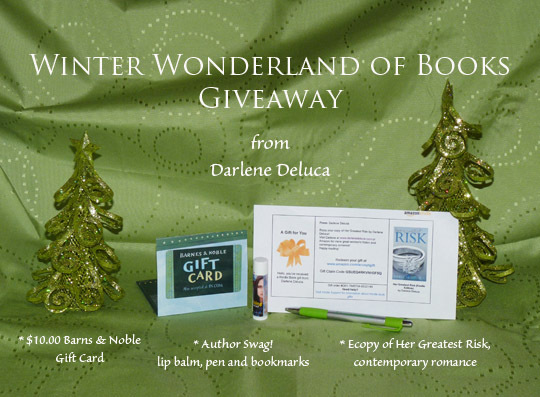 Hey, everyone, I’ve joined with a great group of authors to bring you an exciting Christmas giveaway! Okay, it may seem a little early, but the holidays will be here before you know it. And it’s always a good time to find some new reading material for those cool days when you just want to curl up with your favorite beverage and a good book! This promotion gives you dozens of chances to win books, gift cards, swag and cash prizes! Not only could you win some great stuff, you just might discover your new favorite author! Enter today, and happy reading to all!